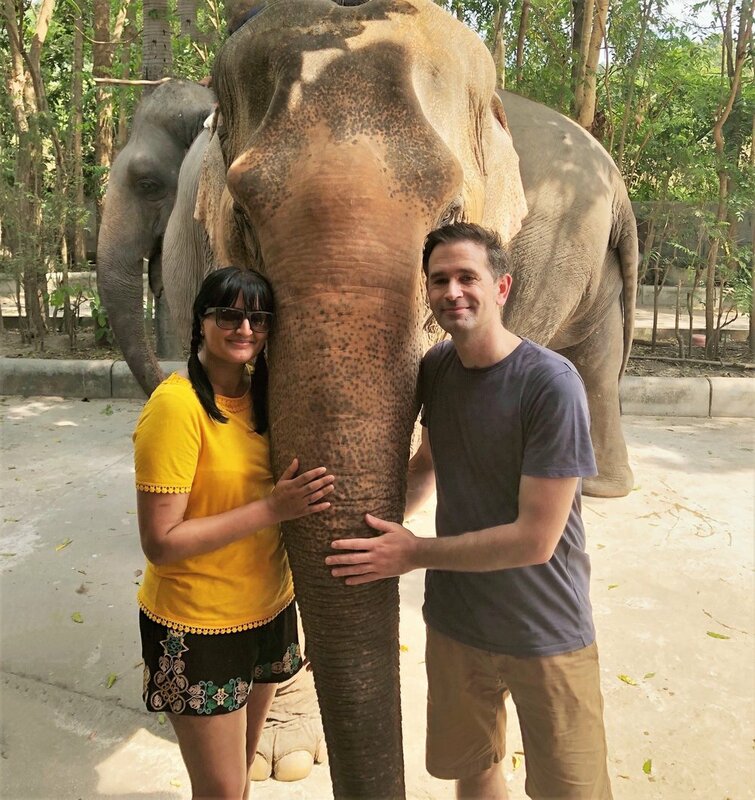 Christmas day 2018, was set to be a very special day for Dr C and I, as it was spent at The Hutsadin Elephant Foundation, just outside the town of Hua Hin in Thailand. Regular readers will know of my love of elephants and the countless hours I spend scrolling through images of them trying to find responsible experiences where I can interact with these gentlest of giants. I’ve been lucky enough to have some amazing elephant experiences in my time but when I heard of Hutsadin, I immediately contacted the Foundation, with a view to booking a responsibly sourced encounter. The Asian elephant has become an endangered species with approximately less than 2000 wild elephants currently living in the wild in Thailand, the reason being mainly due to a loss of its natural habitat. Elephants are also illegally captured in the country and used in the tourism industry. This industry is allowed to thrive as foreign visitors want to ride them or want that all-important selfie riding them. Additionally, many tourists are paying to watch elephants perform tricks. Hutsadin is a non-profit organisation established in 2007, set up by three local businessmen to rescue elephants abandoned by their owners due to ill health, old age or if they were not able to work any longer. Hutsadin is also classed as a special Buddhist place of worship and comprises of a team of paid local Thai staff who take care of the reception area, shrines and provide food and beverages during visits. Currently Hutsadin has six elephants, which range from the ages of 10 to 76 and each has their own unique personality and mannerisms as well as their own dedicated Mahout. There’s the male of the group, Boon Mee and the ladies are Lai Tong, Pheung Wan, Tong Kham, Neung Lan and Song Kran, who is the baby of the group at age ten. This is actually for their own safety as considering their background (in the next paragraph) they can be potentially dangerous and the foundation is in very close proximity to road and houses. They are able to escape from the ring if they wish too, as has happened, however most are aware that food is available here and are in safe hands. The ring is also used for husbandry restraining purposes such as foot care and veterinary procedures. Whilst I’m on the topic, you may notice that the Mahouts carry a bull-hook. This by no means is to cause any harm to the elephants but more for guiding them in directions for their own safety due to them not having good peripheral vision. It is also a tool that they have been familiar with in their previous working lives, albeit used very differently at Hutsadin. All six of the elephants have been rescued from logging, riding or performing in shows, primarily because they are too old and practically worthless to their owners. A few of the elephants have no teeth and therefore require more intense food preparation. The elephants at Hutsadin will never be able to be released back into the wild as they would inevitably be killed and there is no government supported land where they can roam freely. Furthermore the sad fact of the matter is that Asian elephants are still being killed for their ivory, 33,000 elephants are killed each year globally for their ivory, FACT! It is however illegal to take ivory in and out of the country. If you’re unfamiliar with the term, a Mahout is the keeper and driver of an elephant especially in South East Asian countries. The Mahout experience at Hutsadin lasts about 3-4 hours and starts with a short educational session on elephant welfare and husbandry. This was undertaken by Jo, one of the volunteers who have worked at Hutsadin for nine years. Following this we headed over to meet the elephants and learnt about the preparation of their food and I even had a go at cutting some banana tree! However, I must admit it’s not as easy as it looks, the bark is very tough and the knife very sharp! It was then time to grab our baskets of bananas and take the male of the group Boon Mee for a walk in the field. We were joined by Boon Mee’s Mahout as well as Jo. There was plenty of time to interact with Boon Mee and stop as he took a break to rub himself on the trees. It was a truly magical and humbling experience to walk side by side with this gentle giant. In the back of my head I couldn’t help but think what a troubled life this big guy had in the past. Boon Mee is missing half of his tusks. Poverty is quite high in Thailand and unfortunately the man that Boon Mee trusted the most cut his tusks off for money. His Mahout, knew full well that Boon Mee would just let him do this because of the trust they had between them and relied on him to look after his needs. The mahout was aware that if he fully cut the tusks Boon Mee would die and the foundation believe he didn’t want to kill him but was desperate for money. Thankfully he no longer works here and Boon Mee has a new Mahout now. 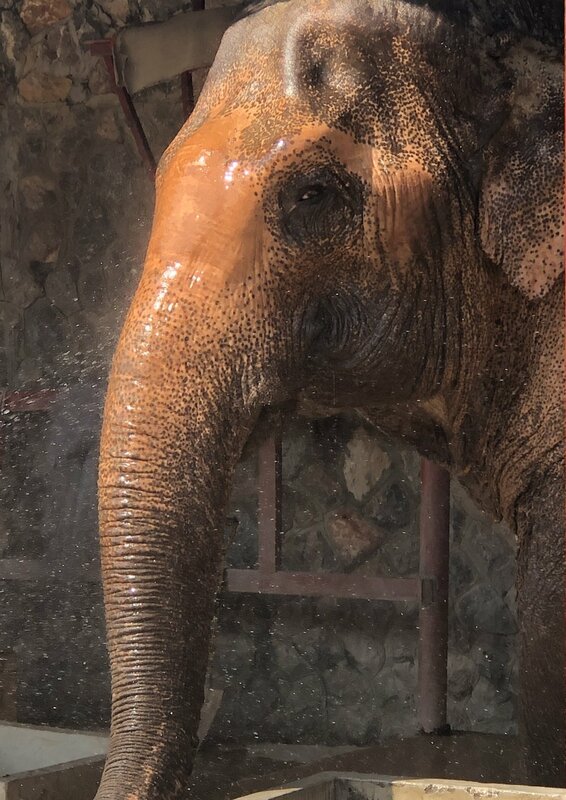 After our walk we gave Boon Mee a shower, which he loved cooling off from the midday sun and sipping on the water from the hose. It was great to see Boon Mee interacting with us playfully whilst we asked Jo about his personality and the elephants daily needs. It was phenomenal being so close to an elephant that had such a bad past but still trusted us to be so close and interact with him. Following the shower we prepared some food parcels for the elephants on restricted diets containing apple, oranges and carrots and watched as the elephants would break open the packages with their trunks to eat their favourite foods first! For me it was very important to responsibly source an elephant experience based on what I’m going to talk about in the rest of the post. In Thailand, it is not illegal to ride elephants. This is a truly cruel thing to do as their spines are not able to bare the weight of humans plus the seat, known as a Howda (even though there is a recommended weight of 150 kgs). Over time this is detrimental to their back bone but most importantly it breaks their spirit. For transparency, I would just like to add for my readers that at Hutsadin, elephant bare back riding is permitted. This is something the owner of the foundation has put into place and not the volunteers. The volunteers will always deter this sort of thing by offering more interactive experiences with the elephants instead. I actually saw guests who requested this and after much talks did ride a couple of the elephants with their Mahouts bare back. It really saddened me and filled me with anger as it defeated the purpose of the work undertaken by the volunteers in their rehabilitation. As wild elephants cannot be ridden, they need to be tamed and this process is somewhat brutal to say the least. Please be warned that what you are about to read is distressing. A baby elephant will be separated from it’s mother in the wild (often the mother will be tortured or killed in front of it) and restricted to live in a very small space such as a cage or hole, which inhibits their movement. The baby elephants are then beaten into submission by means of bull-hooks, clubs and other instruments. They are starved and deprived of sleep for days on end. It is truly disturbing and recently I have come across an award winning photographer, Brent Lewin, for capturing an image of the torture in this article. The final stage of the process; essentially a Mahout is bought in to give the baby elephant its first meal and here starts the bonding process between the two as the elephant now sees the Mahout as its saviour. I am certain that many people who ride elephants are not aware of what they have gone through for the sake of lugging tourists around on their backs. This kind of brutality has been traditional practiced in South East Asia (especially for elephants bought over from Myanmar) for hundreds of years. Elephants were historically used for logging or for the military, however now they are purely for the entertainment of tourists. If travellers didn’t participate in purchasing these unkind rides or circus acts it would for sure deplete the numbers of baby elephants being captured and sold off for our amusement. As a human being and wildlife lover, hearing the way humans have treated these animals fills me with sheer disgust. Hutsadin for me is a safe, caring, environment for these rescued elephants. They are treated with the utmost respect by the volunteers and Mahouts. The education they are providing is invaluable. If you are in the Hua Hin area of Thailand then I would urge you to pay a visit and see for yourself the work of the team. They are truly dedicated individuals who use all the money they receive from the visitors to care for the elephants not taking a salary for themselves. I would love to see these elephants at Hutsadin in the wild but unfortunately it is just not possible and therefore I am filled with solace that they have a place where they are cared for and respected by people who shower them with love and deference. Please source responsibly when it comes to elephant experiences, these truly beautiful, elegant gentle giants don’t have a voice. Help stop their extinction and their torture. It is truly inhumane and just remember these are highly intelligent creatures, they do not forget and breaking their spirit truly lasts a lifetime. It is our responsibility to save these magnificent beasts. Do your research so future generations can enjoy what we have been fortunate to see. My sincere thanks to all the team of volunteers at Hutsadin. Even though you would never claim this, in my eyes, you are all heroes and I am utterly blown away by your kindness to this cause. To Jo and her husband, Will who educated us, transferred their infectious passion, dedication, skills and knowledge. We truly left with the greatest memories and faith in what you are doing to save the plight of the Asian elephant. I’d be really interested to spark up a conversation about this topic so feel free to comment on your own experiences below. Please contact http://www.hutsadin.org/ for donations or more information. The Mahout experience is priced a 1,200THB which is approximately £30 per person.